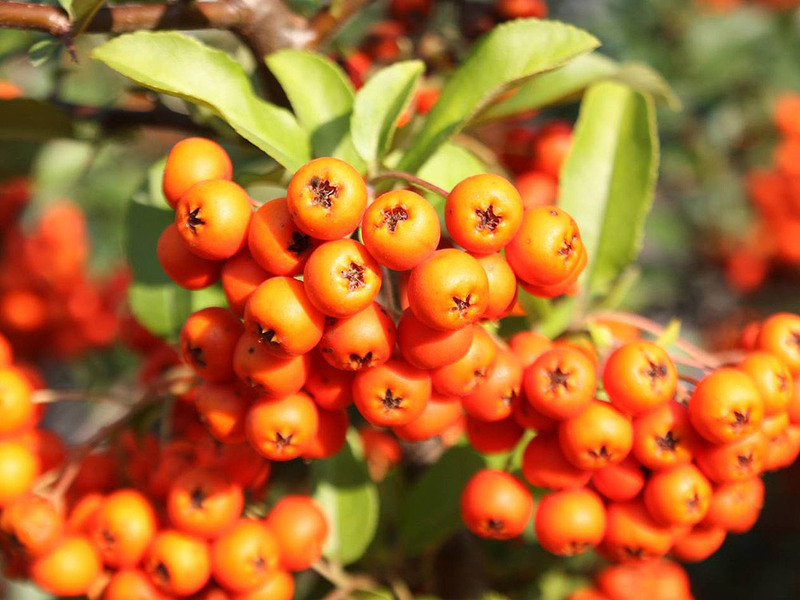 Evergreen Pyracantha is a shrub available in many varieties, firethorns have large clusters of white flowers in spring followed by autumn berries in various shades from deep red through brighter reds and orange to yellow. The berries are borne in large quantities in autumn. 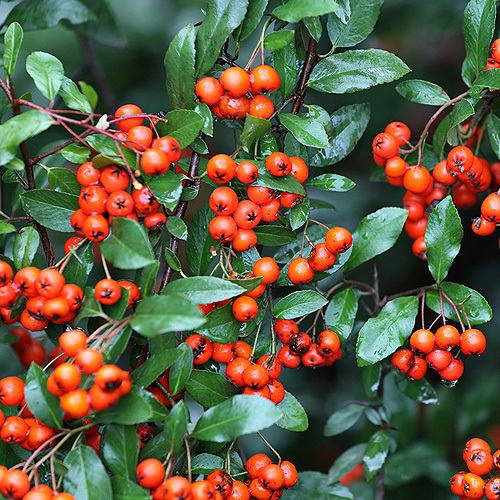 Pyracantha can be grown as a specimen plant, as part of a mixed border, or more commonly as a wall shrub or informal hedging plant. All varieties have large strong thorns which make them excellent security barriers. They are good for wildlife, blackbirds have nested in mine for several years secure in the knowledge that no sane cat would dare try and climb towards them, and also for the berries, blackbirds again love them. For a particularly informal hedge, different varieties can be mixed, and they can also be mixed with barberry, Berberis, or roses without sacrificing the deterrent barrier effect. Other Features: easily trainable, against a wall or fence, simply trim back any shoots that are sticking out too far. Pruning: Prune in mid spring or late summer. For specimens and wall shrubs, aim to establish a permanent network of branches and cut back any wayward growths that come out. More flexible young shoots can be tied back against a support while they are still pliable, as they age and become more woody, they will "set" into the desired shape. Responds to renovation? : Can be renovated usually with success by cutting back to within 30cm, 12" of ground level, though this tends to make them more susceptible to the bacterial disease fireblight. Q. Will Pyracantha attach itself to brickwork and mortar in a damaging way or does it need to be trained onto something, thus avoiding damage to the bricks/mortar? A. Pyracantha is not a clinger at all. 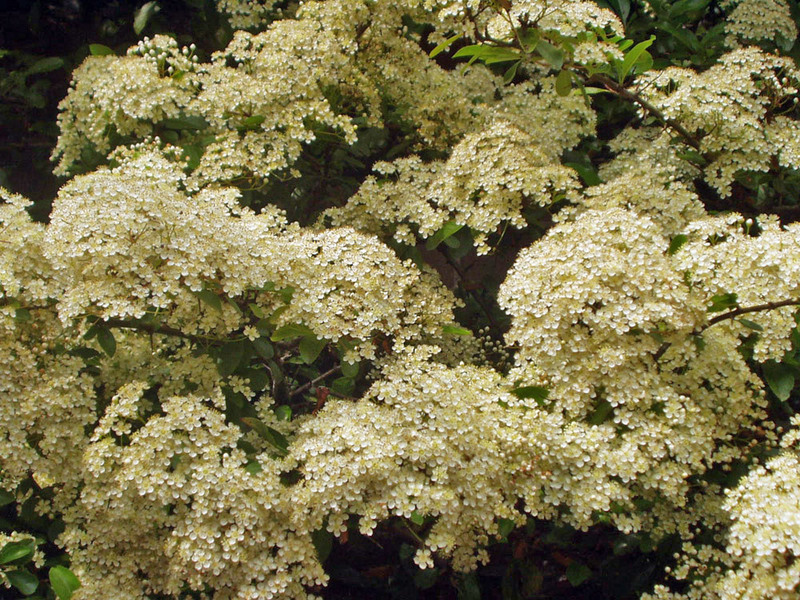 It is a shrub with stiff stems and branches that is easily trainable to be a wall-shrub. It is best attached via a few reasonably strong anchor points for the main trunk and major branches. I have two plants, one is about 10 feet high and attached via the trunk at a single point with two screws driven into the brick work and held in place with strong plastic banding. The other is about the same height, but a bit more rambling and has 3 anchor points. Q. Will Pyracantha deter children climbing over my fence. A. Large and well-knitted Pyracantha would deter small marauding bands of Visigoths - so yes. A. 1/ The "fungus" is more likely to be mealy bugs or woolly aphids - is it patchy? And causes knobbly growth of the stem where it is? Rub it to find out, you'll soon see. These are difficult to get rid of - organic means such as contact insecticides don't work as the woolly stuff just means that anything sprayed on them just washes over the top. Systemic insecticides (taken up by the plant leaves and delivered to the pests via the sap) do work, but you'll probably need to make several applications at intervals of a few weeks. In the longer term, I've heard that ladybird boxes that encourage them to overwinter can work well - place one near the affected plant. 2/ The yellowing leaves may be a result of the summer sun. It's just been so strong and intense that when combined with continuous high temperatures has given many plants a hard time. My own Pyracantha are fairly sheltered, but I have other plants that are showing signs of sun/temperature damage. The aphids will also be putting some more stress on the plant in this regard. I'd give the plant a bit of a treat to try and build it up a bit, give a good long drink with a soluble fertiliser (at least 10L worth) and apply a good deep mulch around the base of the trunk. 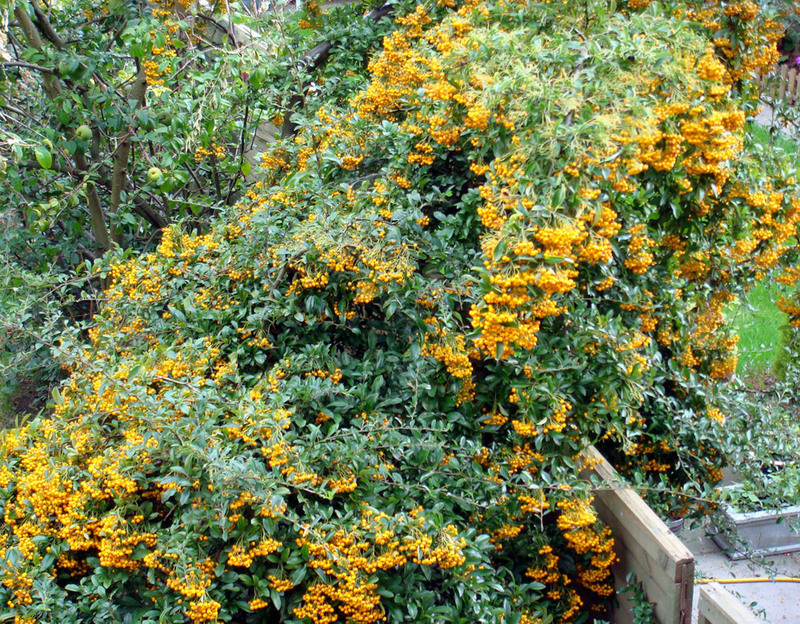 Q. I live in a flat with a patio, would it be possible to grow Pyracantha in tubs? If so, which variety is best? 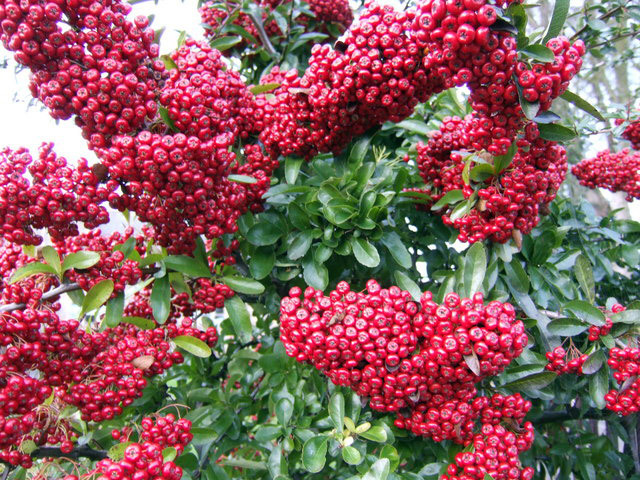 A. Pyracantha are quite irregular in habit, this makes them unsuitable for containers. Yes you could try it, but I wouldn't. Varieties? - I've never seen Pyracantha in containers so can't even comment really. They grow to 3m x 3m minimum and many get larger, the vicious spines make them quite unsuitable too. 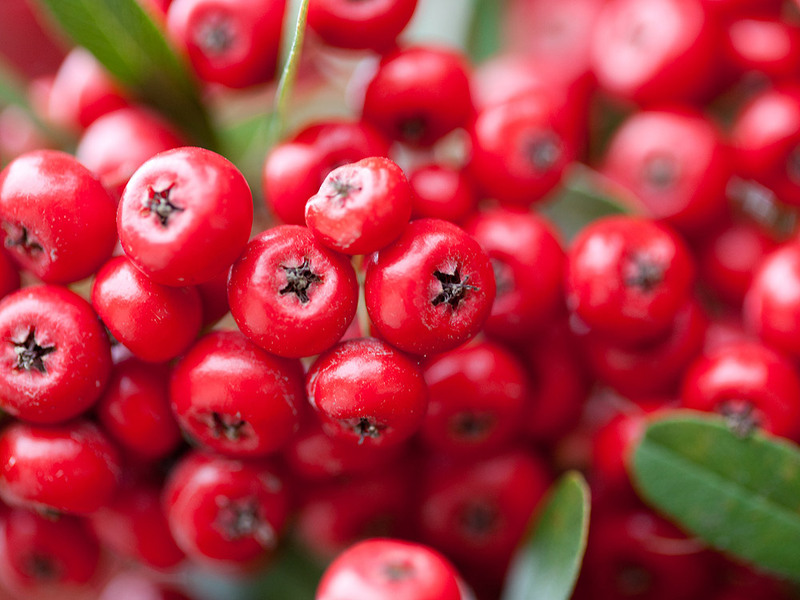 Q. I want my Pyracantha to quickly gain height for screening across and above the fence so is it best to let it grow straight and tall to the required height or should I spread the branches out sideways to begin with. 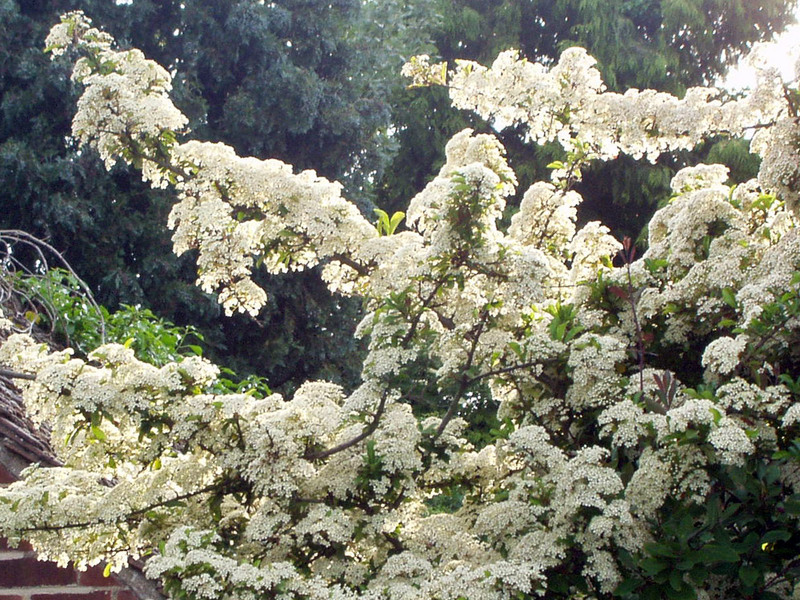 A. Pyracantha is naturally bushy, so I'd just let it grow in the direction it wants to. The stems are quite pliable when young, so if they start to get too tall, you can train them sideways.